In Aquila Children’s Magazine (ages 7-12), February 2014. Norwegian explorer Thor Heyerdahl crossed the open ocean on wooden rafts, risking his life to prove that people in pre-historic times could have travelled the world. When a young, unknown researcher named Thor Heyerdahl claimed people from South America had travelled to the islands in the Pacific Ocean, no one took him seriously. Most scientists were certain: the people who live on these islands, known as Polynesia, had come from Asia. This was because pre-historic South Americans didn’t have any boats which could have survived the long and dangerous journey. Heyerdahl quickly understood there was only way to prove his theory: travel across the ocean himself. A crazy idea for sure, but Heyerdahl had a raft built, using the same materials and methods as the pre-historic South Americans would have used. With a crew of seven, Heyerdahl set out from Peru in April 1947, letting the sea currents and wind take them where it wanted. The Kon-Tiki raft travelled 7,964 kilometres before reaching Polynesia, 101 days later. Heyerdahl had proved he was right: pre-historic South Americans could have crossed the Pacific Ocean. 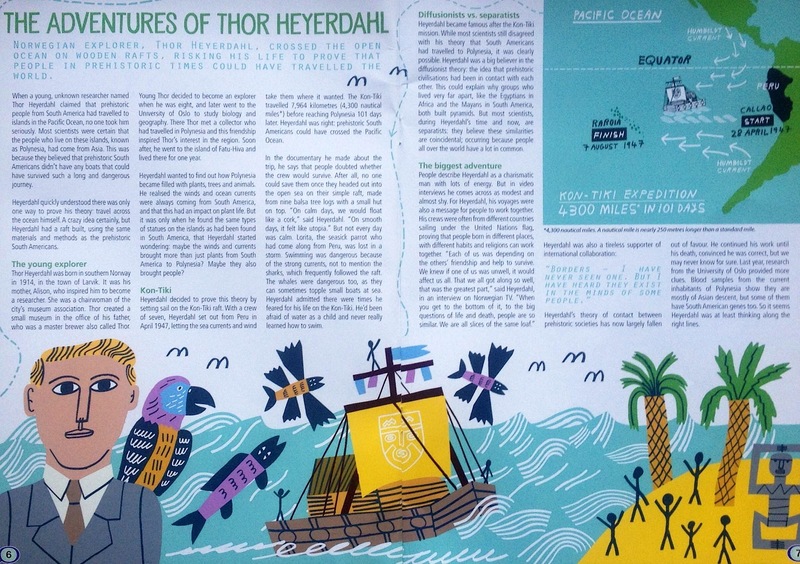 Thor Heyerdahl was born in Southern Norway in 1914, in the town of Larvik. It was his mother, Alison, who inspired him to become a researcher. She was a chairwoman of the city’s museum association, and a supporter of Charles Darwin’s theory of evolution. Thor created a small museum in the office of his father, a master brewer also called Thor. Young Thor decided to become an explorer when he was eight, and went to the University of Oslo to study biology and geography. There Thor met a collector who had travelled in Polynesia, a friendship which inspired Thor’s interest in the region. Soon after, he went to the island of Fatu-Hiva and lived there for one year. Heyerdahl wanted to discover how Polynesia originally became filled with plants, trees and animals. He realised the winds and ocean currents were constantly coming from South America, and that this had consequences for plant life. But it was only when he found the same types of statutes on the islands as previously found in South America, that Heyerdahl started wondering: maybe the winds and currents brought more than just plants from South America to Polynesia? Maybe they brought people too? This was when Heyerdahl decided to prove this theory by setting sail on the Kon-Tiki. In the documentary he made about the trip he talks about how people doubted whether the crew would survive. After all, no one could save them once they headed out into the open sea on their simple raft, made from nine balsa tree logs with a small hut on top. “On calm days, we would float like a cork,” said Heyerdahl. “On smooth days, it felt like utopia.” But not every day was calm. Lorita, the seasick parrot who had come along from Peru, was lost in a storm. Swimming was dangerous because of the strong currents, not to mention the sharks which frequently followed the raft. The whales were dangerous too, as they sometimes topple small boats at sea. Heyerdahl admitted there were times he feared for his life on the Kon-Tiki, as he had been afraid of water as a child and really learned how to swim. Heyerdahl became famous after the Kon-Tiki mission. While most scientists still disagreed with his theory that South Americans had travelled to Polynesia, at least it was clear it was possible. Heyerdahl was a big believer in the diffusionist theory: the idea that pre-historic civilisations had been in contact with each other. This could explain why groups who lived very far apart, like the Egyptians in Africa and the Mayans in South America, both built pyramids. But most scientists, both during Heyerdahl’s time and now, are separatists: they believe these similarities are coincidental, probably occurring because people all over the world have a lot in common. Heyerdahl’s next sea voyage came in 1969, after he found pictures of reed boats during his archeological digs on Easter Island in Polynesia. Reed boats were also common among Mediterranean civilisations, meaning people could have travelled from there to South America, and then to Polynesia. Heyerdahl decided again to prove the skeptics wrong, and built a boat out of reeds and set sail from Morocco. Ra 1 had to be abandoned after 5,000 kilometres, but Heyerdahl was undeterred. Ten months later he tried again with Ra 2, which successfully reached South America. Heyerdahl’s largest reed boat was built in 1977, this time with the ability to navigate instead of just drifting. The Tigris set out to prove it had been possible for people in the ancient civilisations of Mesopotamia, Egypt, and the Indus Valley to be in contact with each other. After five months at sea, the Tigris ended its voyage by the Red Sea, where Heyerdahl burned the proud ship in protest of the wars happening in the surrounding countries. Heyerdahl died in 2002 when he was 87 years old, living with his third wife Jacqueline in Italy. He had five children from two previous marriages: Bjørn, Thor Junior, Annette, Marian and Helene Elisabeth. While the theory of contact between pre-historic societies has now largely fallen out of favour, Heyerdahl continued his work until his death, convinced he was right. We may never know for sure, but last year research from the University of Oslo provided clues. Blood samples from the current inhabitants of Polynesia show they are mostly descended from Asia, but some of them have South American genes too. So it seems Heyerdahl was at least a little bit right. Posted on 01/29/2014 by Jess. 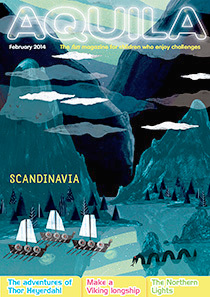 This entry was posted in Lifestyle features and tagged adventure, aquila, children, feature, thor heyerdahl. Bookmark the permalink.